Para-Coat Technologies Parylene conformal coating services offer solutions and provide protection to elastomer parts in electronic, medical, aerospace, automotive and military applications. Parylene coatings protect a variety of rubber and elastomeric components ranging from gaskets and seals, to keypads and medical catheters. Medical grade silicone or rubber products benefit from the biocompatible, non-toxic and chemically inert protective barrier that Parylene coatings provide. The Parylene coating is applied through a vapor deposition process in a vacuum chamber and during the coating process the Parylene monomer is able to penetrate the surface of rubbers and plastics providing exceptional adhesion. 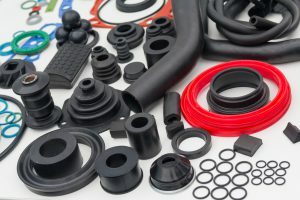 Parylene’s thin, transparent and flexible characteristics enhance the performance of rubber and elastomer components by protecting surfaces and modifying surface properties. These improvements are made without degrading the functional performance of the part. Parylene yields a truly conformal coated part with a consistent thickness on the flat surface area and around the internal dimensions of holes. Pinhole-free parylene coating can prevent the transfer of substances into or out of a coated substrate, even in one or two micron layers. Parylene conformal coatings seal micro porosity and encapsulate the most complex typographies, providing protection against potential leachable ingredients in the elastomer product. The inherent and excellent dry lubricity characteristics with a coefficient of friction measurements approaching that of PTFE to a range of applications make Parylene a valuable asset as a dry-film lubricant, particularly as a coating for surgical instruments. The barrier performance and chemical inertness of parylene are particularly useful for biomedical objects or single-use medical instrumentation items with rubber seals, plungers or diaphragms. Such substrates may come in temporary or prolonged contact with human tissues, and could otherwise be compromised. Parylene coating is also used for silicone rubber keypads, preventing printed legends, resisting surface wear, and resolving tackiness issues while protecting the keyboard against dirt, dust and oils. The applied film has high dielectric strength, and does not compromise the electrical insulating properties of underlying rubber components. Parylene provides a pinhole-free barrier to protect against moisture, corrosive body fluids, common gasses, fungus and temperature. Increased coating thicknesses further improve chemical and solvent resistance without adding weight or materially affecting the substrate’s elasticity.